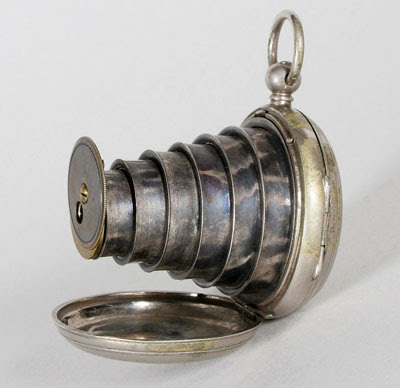 The Lancaster Watch Camera was patented in October 1886 and made until 1890. However, it would have been very inconvenient to use as four very small catches had to be released in order to remove the glass screen and to fit a separate metal sensitised material holder for each exposure. Daimler, the automotive pioneer usually associated with building the world's first successful internal combustion engine (and, subsequently, the first automobile), staked his claim of priority in the two-wheeler world a year before developing his famous auto. 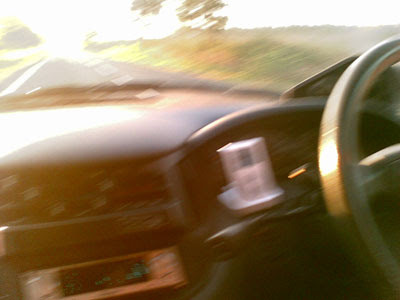 However, the idea of a motor-driven, two-wheeled vehicle did not originate with Daimler, nor was his the first such contraption to see the road. Sylvester Roper, who spent the U.S. Civil War working in a Union armory, built a primitive "motorcycle" as early as 1867. Roper's supporters - and he has more than a few - argue that he should be credited with building the world's first motorcycle. What gives credibility to Daimler's claim of developing the first "true" motorcycle is the fact that it was gasoline-driven. Roper's post-Civil War hog, with a tiny two-cylinder engine, was powered by steam. 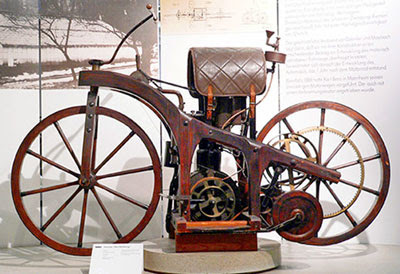 Daimler's motorcycle was essentially a wooden bicycle frame (with foot pedals removed) powered by a one-cylinder Otto-cycle engine. It may have also included a spray-type carburetor, then under development for use in the Daimler automobile that appeared in 1886. I can't remember how I came across this series. I think it was while browsing IMDB for information about an episode of West Wing... or maybe Studio 60 on the Sunset Strip. What I do know is that it is I'm glad I discovered it. 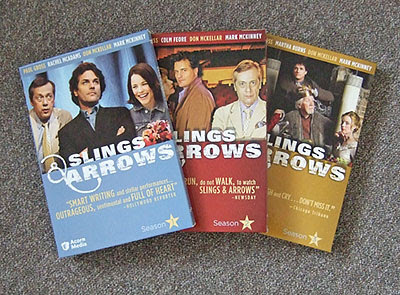 Each 6 episode series of Slings & Arrows focuses on the performance of a Shakespeare play, and although I'm woefully ill-informed on Shakespeare's works, I'm fairly sure that themes from the play are being woven into the plot as well. The actors are all excellent. The characters are finely drawn, and there is a warmth to the writing that rarely caricatures or deprecates people. The narrative is intricate but clear, drawing you into the story and making you laugh and cry by turns. And it has made me enjoy and want to know more Shakespeare. In fact, I'm booked to watch Macbeth in October. The movement of a colossal "mounds" of water in the North Atlantic and Pacific oceans may have caused sea levels to suddenly begin rising more quickly in the 1920s, researchers say. Their analysis presents a more complex picture of sea-level change and suggests that the rate of change has been more dramatic than previously thought. 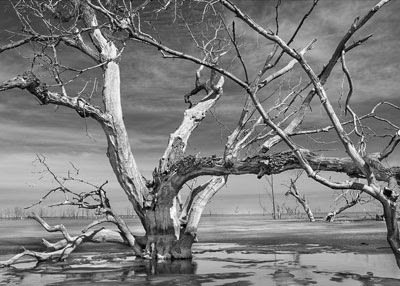 Data collected using tidal gauges dotted along the Atlantic and Pacific coastlines during the late 19th and 20th centuries suggest that sea levels suddenly began rising more quickly around the 1920s, from about 1 millimetre per year to about 1.8 mm per year. This change has previously been attributed to climate change. However, precisely why oceans suddenly began rising more quickly in the 1920s has remained a mystery. 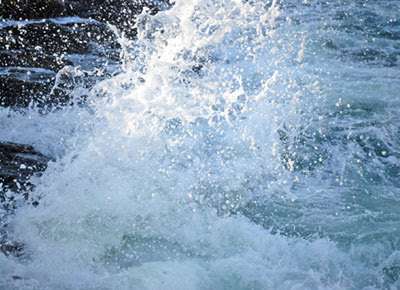 Now, evidence gathered by Laury Miller of the US National Oceanic and Atmospheric Administration and Bruce Douglas, of the Laboratory for Coastal Research in Florida, US, suggests that this change may be partly explained by the pressure-related movement of gigantic amounts of water. The researchers studied atmospheric pressure records for the late 19th and 20th centuries and used these records to try and work out how rising sea levels may be been affected by shifting ocean peaks, known as "gyres", in the North Atlantic and Pacific Oceans. These ocean peaks are produced by water swirling in a circular direction around the ocean as a result of atmospheric pressure, wind and heating. The movement, combined with the turning of the Earth, causes water at the centre of the circle to rise upwards, forming a peak, or gyre. The North Atlantic and Pacific gyres are each about 1 metre taller at the centre than at the edge. But atmospheric records suggest that the gyres in both oceans sank during the 1920s, releasing water held in the centre and allowing it to flow towards the coasts. This would explain the sudden change in the rate at which sea levels changed at this time, measured by coastal instruments. Since tidal gauges only measure sea-levels along the coasts, they could not have detected the drop in levels towards the oceans' centres. If the researchers are correct, this means the overall sea levels were in fact rising more slowly at the time. This, in turn, implies that the rise of sea levels accelerated faster over the 20th century than previously thought. dpreview have posted a 'detailed preview' of Canon's replacement for the class-leading 'prosumer' EOS 30D. As the owner of a Sigma SD9, I have a tendency to dismiss SLRs fitted with Bayer CCDs. However having visited dpreview's recently posted range of beta sample images taken with the EOS 40D, I'm extremely impressed. The colours are natural, detail is excellent, and a couple of pictures taken at ISO 3200 has almost no noise or smearing at all. In fact, they are almost indistinguishable in quality from images captured with Canon and Nikon 'Pro' cameras costing between £4,000 - £6,000. 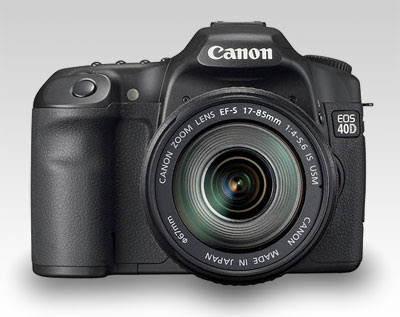 The EOS 40D is released in October, costing in the region of £1,000. 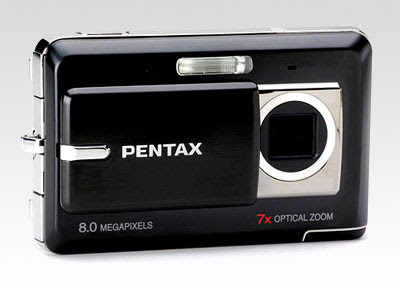 The Optio Z10 features a 7x optical zoom lens that covers focal lengths equivalent to 38-266mm for 35mm format, and features a refraction lens system so the lens never protrudes from the camera while zooming. 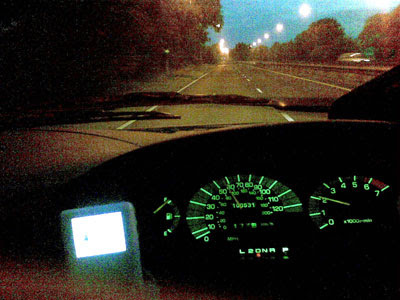 Up to 3200 ASA. 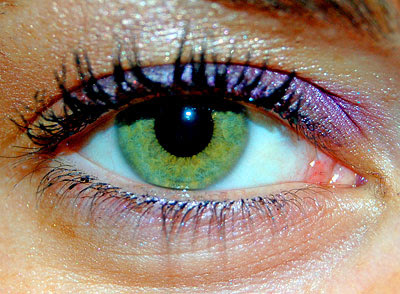 8 megapixels. 94 x 58 x 25mm (think, deck of credit cards). VG Chartz reported on Wednesday that as of August 23, Wii worldwide sales will have surpassed life time Xbox 360 sales in less than a year. 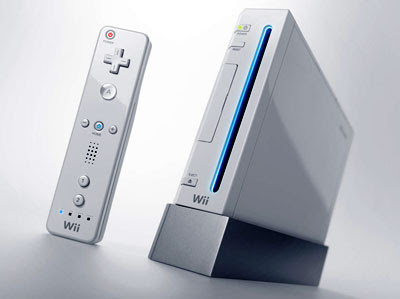 In so doing, the Wii has become the fastest selling console of all time. According to the study, total Wii units sold stand at 10.6 million, slightly more than the Xbox 360's estimated 10.5 million. Since its release, the Wii has outsold 360 by a margin of more than 2 to 1. By comparison, Sony's PS3 has sold just 4.3 million systems worldwide since launching last November. 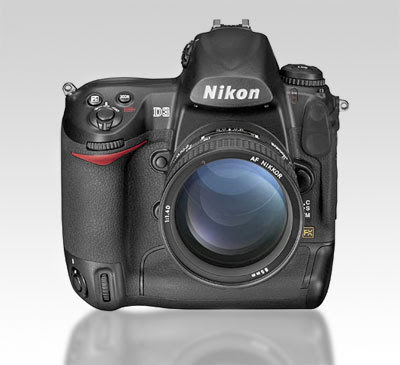 Nikon has today lifted the covers on their first full-frame digital SLR, the 12.1 megapixel D3. The D3 is all about speed and sensitivity, twelve megapixels on a big CMOS chip means large photosites (8.45 µm pitch to be precise) and that adds up to base sensitivity of ISO 200 to 6400 with an additional two stop boost over that (up to ISO 25600). The other side of the speed story is that the D3 can shoot at nine frames per second with AF tracking or eleven frames per second without. Other headline features are a new 51-point AF sensor, color AF tracking, a 3.0" 922,000 pixel LCD monitor with Live View (including contrast detect auto-focus), HDMI video output and even a virtual horizon function which can tell you when you're holding the camera perfectly level. The D3 will be available in November, at around US$5000. Olympus today announced its SP-560 UZ - successor to the SP-550 UZ which caused quite a stir on announcement with its unprecedented 18x zoom. It's still here but the move to a slightly larger sensor has shifted the range toward the wide. The specs now read 27- 486 mm rather than topping out on the far side of 500 mm. Olympus has fitted this camera out with all it's latest technology so let's hope the slightly disappointing image quality we encountered with the 550 is a thing of the past. 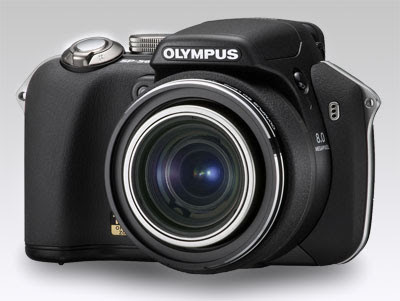 The Olympus SP-560 UZ will be available from October 2007 at around £350. LG Electronics today announces plans to launch the "LG Viewty" (LG KU990), a sleek touchscreen handset with advanced imaging features. With its 5.1 megapixel camera, manual focus and image stabiliser features, the phone takes high-quality photographs with endless possibilities to allow users to enhance their images through the extensive editing features. The sleek, feature-packed handset introduces the world's first 120 fps video recording feature in a mobile camera phone. 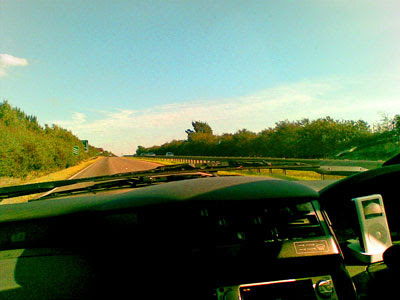 Further, a single-click connection to YouTube allows users to share their very own film moments with others on the internet. 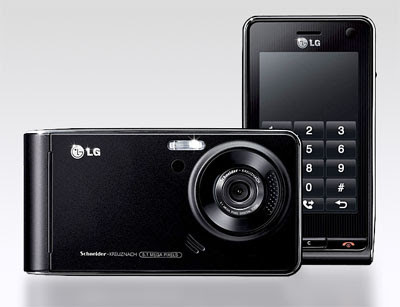 The LG Viewty will be available for purchase on contract with multiple operators in the UK later this year and will first be revealed during IFA 2007 in Berlin on August 31, 2007. 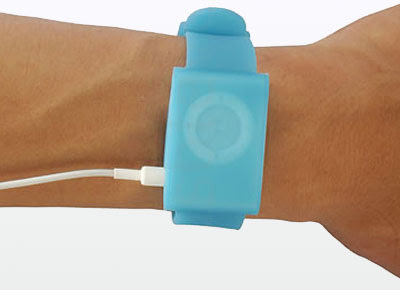 This iPod Shuffle watch band is a novel way of carrying your Shuffle around. It is available from USB Fever in blue, green, pink, purple, black and white, and costs $10 (about £5). 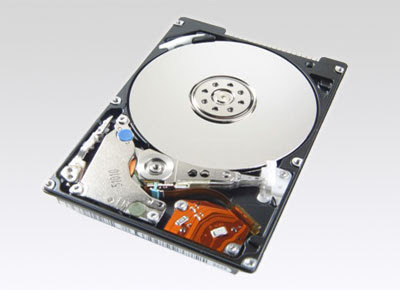 The Toshiba MK3252GSX drive spins a pair of 160GB platters at 5,400rpm with an 8MB buffer and 12ms average seek time over a 3Gbps SATA interface. The drive is 9.5-mm tall [Thin enough to fit in a MacBook, Ed]. 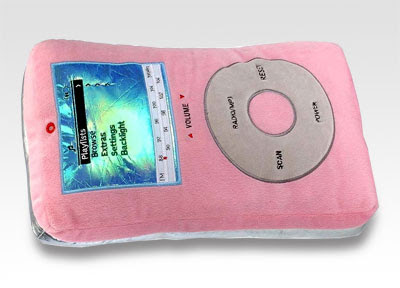 Colleagues in Japan and after them in the USA have discovered that the iPhone has a precedent in Braun’s past. 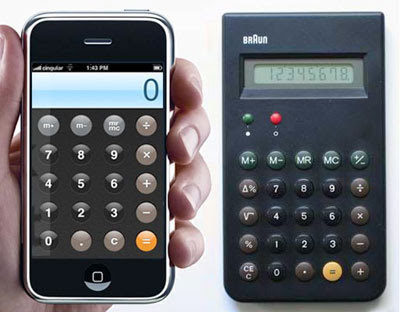 The electronic calculator ET33 from 1977 has pretty much the same form factor as the revolutionary iPhone. The ET33 and its successors up to ET88 featured those cool semi-spherical buttons. Samsung today announced that its new highest-capacity-yet 1.8" drive, smaller than a business card and providing 160 GB capacity at 4200 RPM. 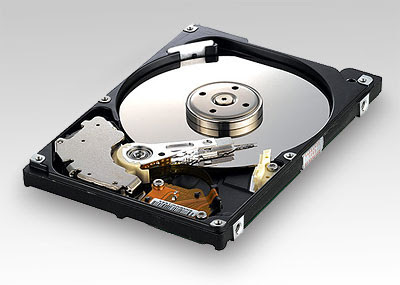 The Spinpoint N2 is the same size as the drives in larger capacity iPods, and has the capacity to store more than 40,000 MP3 files or 100 HD quality movies. 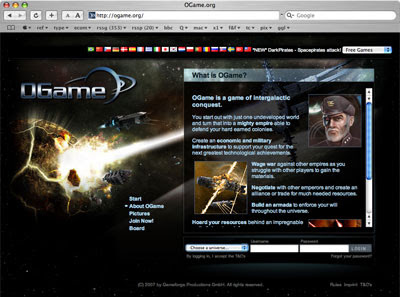 OGame is an online game of intergalactic conquest that my boyz have discovered recently. It's free to play, and works on just about any modern web browser. "You start out with just one undeveloped world and turn that into a mighty empire able to defend your hard earned colonies. You then create an economic and military infrastructure to support your quest for the next greatest technological achievements. "Wage war against other empires as you struggle with other players to gain the materials. Negotiate with other emperors and create an alliance or trade for much needed resources. 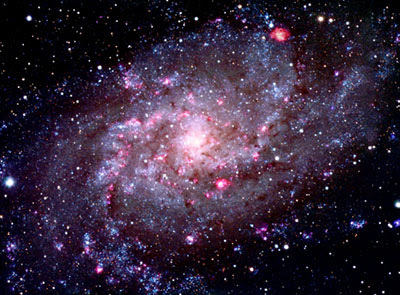 Build an armada to enforce your will throughout the universe." Those suffering from advanced stages of macular degeneration may by the end of this year be able to halt and even reverse vision loss caused by the age-related eye disease. The optical prosthetics, tiny enough to be balanced on a fingertip, dramatically improved the vision of about two thirds of the 206 patients studied in a 24-month clinical trial, according to a new study published in Archives of Ophthalmology. Macular degeneration is a disorder of the central retina, or macula, that causes the afflicted person to see a dark spot in the center of his or her field of vision, impairing the ability to read, recognize faces and watch TV. The implantable mini-scope works with the eye's cornea like a telephoto system, rendering an enlarged retinal image designed to reduce the area of diminished vision. The device is a compound telescope system that consists of a glass cylinder that is 4.4 millimeters in length and 3.6 millimeters in diameter and houses wide-angle micro-optics. The 206 patients in the study shared a number of characteristics, including stable, untreatable, age-related macular degeneration in both eyes with visual acuity no better than 20/80 but no worse than 20/800, along with good peripheral vision. A year after the trial was completed, 90 percent of patients were able to see two lines better on a reading chart, and 67 percent were able to see three lines better, the equivalent of doubling their vision. The Phoenicians populated the island now known as Lanzarote around 1100 BC. The first known record came from Pliny the Elder in the encyclopedia Naturalis Historia on an expedition to the Canary Islands. The names of the islands (then called Insulae Fortunatae) were recorded as Canaria (Gran Canaria), Ninguaria (Tenerife), Junonia Mayor (La Palma) and Capraria (El Hierro). Lanzarote and Fuerteventura were only mentioned as an archipelago. After the fall of the Roman Empire, the Canary islands became abandoned until 999 AD when Arabs created a few settlements. In 1336, a ship arrived from Lisbon under the guidance of Lanzarote da Framqua. From 1730 to 1736 the island was hit by a series of volcanic eruptions, creating 32 new volcanoes in a stretch of 18 km. Lava covered a quarter of the island's surface, including the most fertile soil and eleven villages. 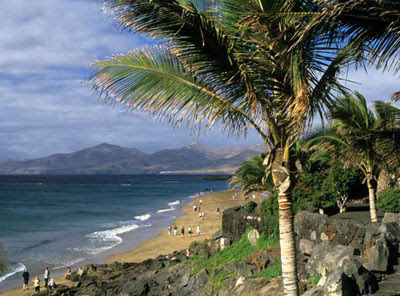 In 1927, Lanzarote as well as Fuerteventura became part of the province of Las Palmas. Brett and his four kidz will be staying at a villa near Puerto del Carmen for a week, starting today. This paragraph is the only part of this blog that wasn't cribbed from Wikipedia. 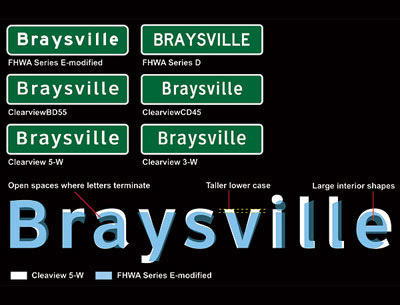 The New York Times has published a long and informative article on the work of Don Meeker and James Montalbano to make US road signage more legible. Worth a look, if only to view the excellent slide show of the typeface development. Gustave Whitehead, pioneer of powered flight? That few people outside of aviation buffs have ever heard of Whitehead (originally "Weisskopf" before he immigrated to America from Germany) can be attributed to several factors, including, his defenders say, the outright refusal of the Smithsonian Institution to even consider the possibility that anyone beat the Wright Brothers into the air. Nevertheless, that's exactly what Whitehead appears to have done. 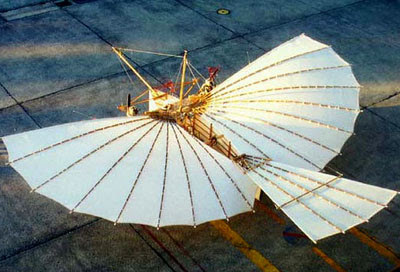 Although there is an affidavit supporting Whitehead's claim to making a bona fide flight as early as April 1899 (filed by an assistant who said he was scalded by steam from the aircraft's motor), his August ascent was the first one clearly documented and witnessed by people not associated with the project. Four flights were reportedly made that day, the first coming before daybreak. Three others followed in the afternoon, including a mile-and-a-half journey where Whitehead reached an altitude of 200 feet. In contrast, Orville Wright's historic "first" flight on Dec. 17, 1903 lasted a mere 12 seconds while traveling 120 feet. Four gigantic galaxies have been seen crashing into one another in one of the biggest cosmic collisions ever seen. Dr Rines likened the collision to "four sand trucks smashing together, flinging their contents everywhere". The new quadruple merger was discovered serendipitously during a survey of massive galaxy clusters consisting of tens to hundreds of galaxies. The Spitzer Space Telescope spotted an unusually large fan-shaped plume of light emerging from a gathering of four elliptical galaxies in the cluster CL0958+4702, which is located nearly five billion light-years from Earth. 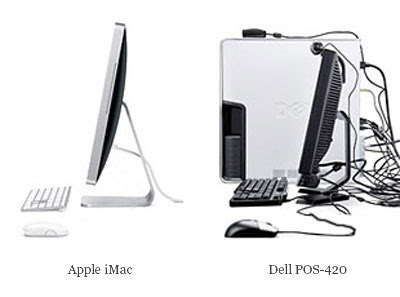 Apple has released a stunning new range of iMacs, along with significant upgrades to the .Mac online services and the iLife and iWork software packages. 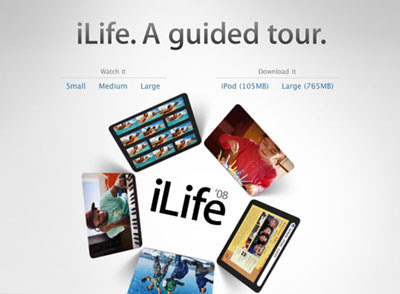 Visit Apple's website to view a range of well-produced and informative movies demonstrating how Apple are continuing to produce hardware and software that is as enjoyable to use as it is to look at. Warning: if you're thinking of downloading the movies, some of them are HUGE. Oh, and so the boys don't get left out it's also available in blue (with really cool silver stars). NASA plans to deal with killer comets or asteroids on collision courses with Earth are more advanced than many analysts had thought. Flight International reported on Friday that the agency's Marshall Space Flight Centre has developed designs for an asteroid-buster spacecraft which could be launched using the future Ares V cargo rocket. According to Flight, Marshall engineers based their design study around the 99942 Apophis asteroid, which rounds the Sun eccentrically, veering in and out between the orbits of Mercury and Mars. Apophis is estimated to be perhaps 270 metres across and it will pass close to Earth in 2029, well inside the orbit of the Moon and closing in to the same sort of distance as geosynchronous satellites. Further observations have refined the data and it is now known that the likelihood of a collision with Apophis in the foreseeable future is extremely small. Disappointingly for fans of Armageddon, the NASA asteroid-defence mission included no role for any eccentric oil-drilling experts, nor even any straight-arrow astronauts. The human race would rely on robots to sacrifice themselves for our survival. 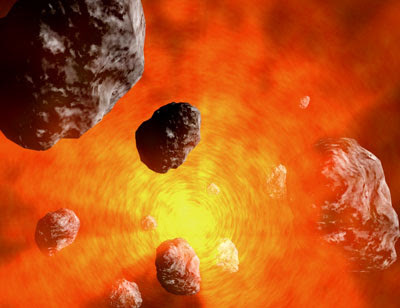 Initially, a recce probe would be sent out in order to make sure of a threat asteroid's composition and flightpath; then the main mission would follow, blasting off in 2020 or 2021 in the case of Apophis. Rather than smashing any troublesome space rock to pieces, it seems the plan would be to give it a relatively gentle nudge while it was still far away, so that it missed the Earth cleanly. Of course, a 20 million tonne boulder would need a hefty nudge - and under the headline-grabbingest NASA plan this would be delivered by a volley of up to six nuclear missiles packing 1.2 megaton B83 warheads. These would detonate a hundred metres or so from the asteroid, and the heat of the explosions would cause part of it to vapourise and shove the remainder to one side. There was also an alternative design for the boulder-buster mission, in which the shunting missiles would use only their own kinetic energy. There was a third, more groovy option in which a solar powerplant craft would fly alongside the menacing meteor and focus the sun's rays to boil off asteroidal material, which would have the effect of gradually easing it off the path of danger. Apparently, the three different plans are each optimised for different types of asteroid. Once the composition of a dangerous space object was known, the design of the interceptor would be selected. NASA reportedly assessed that the nuclear option could push 100 metre to 500 metre sized boulders safely off course given two years' warning, and larger ones with a five year heads-up. Animal rights campaigners have condemned the research, saying that it is morally repugnant to create an animal doomed to mental suffering. The mice were created by modifying their DNA to mimic a mutant gene first found in a Scottish family with a high incidence of schizophrenia, which affects about one in every 100 people. The mice’s brains were found to have features similar to those of humans with schizophrenia, such as depression and hyperactivity. “These mutant mice may provide an important new tool for further study of the combinations of factors that underlie mental illnesses like schizophrenia and mood disorders,” said Takatoshi Hikida, of Johns Hopkins University in Baltimore, a leading researcher. The egg cells of mice were genetically modified by inserting a gene associated with schizophrenia into their DNA. The eggs were fertilised and grown into viable baby mice using surrogate mothers. 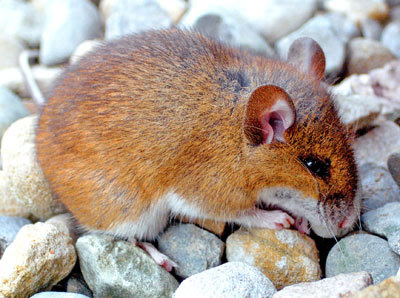 Animal Aid, a campaign group, said rodents were not a reliable way of modelling human disease. 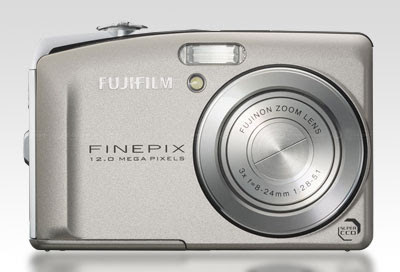 The Fujifilm F50fd has a lot to live up to, its the model to replace the F31fd, a camera we have raved about ever since we reviewed it as about the only compact camera you can use confidently at high sensitivities. The F50fd takes quite a jump from the F31fd's six megapixels, it now has twelve megapixels and that only makes us wonder if it will be able to match the F31fd's high ISO performance. 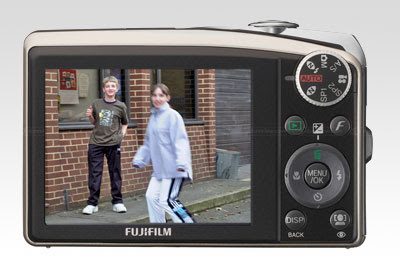 The F50fd also features a mechanical CCD-shift image stabilization system, improved face detection, ISO 1600 at full image size and a 2.7" LCD monitor. The F50fd should be available in September at around $300. Regular readers of this blog will know that I consider this line of cameras to be the finest examples of their genre. For more details visit here and here. Chuck Kimmerle takes beautiful photographs. A method for making a one atom thick sheet of carbon has been developed by researchers at the Rensselaer Polytechnic Institute. 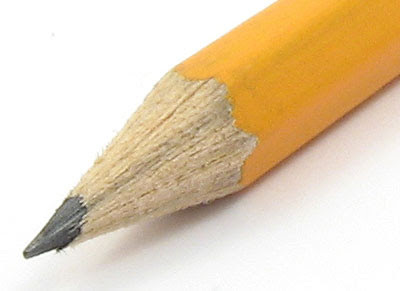 Graphite, as found in most everyday pencils, is made up of countless layers of graphene, but for years scientists battled to separate out the individual layers. Using ordinary adhesive tape the researchers managed to obtain single strips of graphene simply by using the gentle stickiness of the tape to break apart the layers. Graphene is a very efficient conductor, making it ideal for use in nanoelectronics, and two years of research has revealed detailed information on how the length and width of graphene directly affects the material's conduction properties. Saroj Nayak, an associate professor in Rensselaer's Department of Physics, Applied Physics and Astronomy, along with graduate student Philip Shemella and their team, have outlined their findings in the 23 July issue of Applied Physics Letters. The size of computer chips has shrunk dramatically over the past decade, but has recently hit a bottleneck, explained Nayak. As copper interconnects get smaller, the copper's resistance increases and its effectiveness as a conductor degrades. This increase in resistance creates heat, which can have negative effects on the speed and performance of the chip. Because of graphene's excellent conductivity it is considered to be a possible successor to copper. The staff at Paultons Park near Romsey, Hampshire, were concerned that their two existing meerkats would fight with three new arrivals. "It is normally extremely difficult to integrate new meerkats into an existing group - their usual instinct is to try to attack any newcomers. However, thanks to a suggestion from our vet, Kate Chitty, we were able to neutralise all odours by using a little Vicks VapoRub on the nose of each meerkat. The meerkats then all smelled the same to each other and the 'old guard' accepted the new arrivals." The sociable and highly territorial animals originally come from southern Africa. 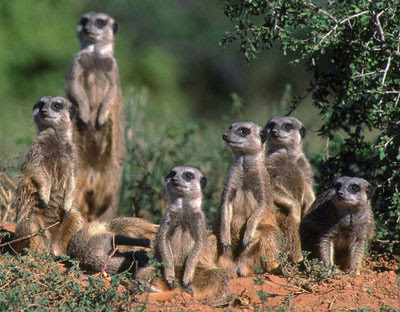 A group of five or more meerkats is called a mob or a gang.